When buying gifts for Mom, you want to steer clear of the typical ones which you usually buy. If you want to buy her something different, this list is full of personalized gifts for Mom which she’ll love. 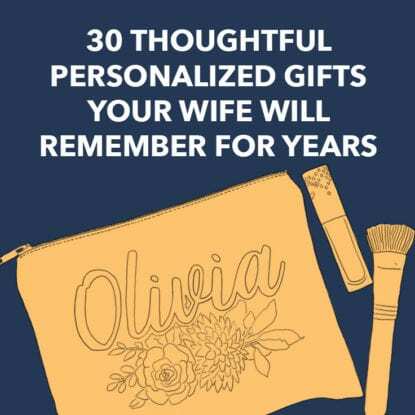 There’s jewelry, ornaments, and even kitchen equipment; they can all be personalized to mean something to her. If you’re looking for personalized gifts for Mom, they don’t get more personal than this. Select one of her favorite photos, whether it’s of herself or the whole family, and have it made into the most beautiful oil painting which she can hang in her house with pride. As nice as photos in frames are, we can’t have every single photo we take hanging on the wall. But having them on the computer isn’t much good either. So instead, why not get them made into a photo book which you can get out whenever you want to see them? Knowing where you come from is a big deal and finding out which types of ancestry are within you is so interesting. Mom will be able to discover where her roots lie with this home Ancestry DNA kit. All she needs to do is provide a saliva sample and wait for the results. Does Mom have a special place, somewhere she loves visiting which hold important memories for her? It could be where her children were born or where she met her husband. If so, she can wear the coordinates of this amazing place close to her with this engraved pendant. Beach holidays are the best kind, right? Surprise Mom with this personal and unique necklace which will contain her chosen beach’s sand inside; it could be the beach she honeymooned on. She’ll love being able to tell people what this necklace means to her and the memories she has of that beach. This would make a perfect gift for a newly married couple. Inside this gorgeous wooden box, there’s 3 bottles of wine which are to be opened on their 1st, 3rd and 5th wedding anniversaries. It’s an ideal excuse for them to sit down and celebrate their special occasion together. Birthdays are a great time for you to celebrate someone’s life and achievements throughout the years, and this is the perfect gift to show them what was happening in the world on their birthday each year, from when they were born to present day, straight from the front page of The New York Times. If your family live all over the world, you all need one of these signs in your house or yard to remind yourself that they’re still close by. Personalize this cute signpost with the important members of your family, their location and distance from you. Whether you give this as a housewarming present, wedding or anniversary gift, the couple who receives it will absolutely love it. Their names will be carved into the top of this cutting board, making them smile any time they’re making their evening meal for each other. Is there anything better than having fresh flowers in your home? The look and smell of them just makes a house instantly feel like a home, and this personalized photo collage vase is the perfect thing to hold those fresh blooms, while your family members’ faces beaming at you will also make you feel happy. Perfect for Mom to keep on her desk at work, this paperweight contains a special place to her in the center. It could be anywhere on the planet, just somewhere which hold memories for her. Any time she lifts it, she’ll remember those happy times and her mood will be lifted. Carving a couple’s initials into the trunk of a tree is something we’ve seen happen for years and years – it’s cute and romantic. Give her this brass cuff which is hand cast from real birch bark and have their initials carved into it. All the romance without harming a tree. Hashtags are seen all over social media now, we use it to tag our posts or photos with relevant things. Keep Mom up to date with this trend with this cute hashtag necklace. You can have it say absolutely anything, from a motto to a nickname. Family holidays are something we all remember, right into our adulthood – spending time with our parents is a special memory. If you went on a lot of camping holidays when you were younger, Mom will cherish this personalized camping art which captures that memory perfectly. When it comes to personalized gifts for Mom, this hand painted family tree serving bowl is something she’ll use over and over again. On those family dinners you all share, or one of her fabulous dinner parties, she’ll be able to bring it out and it’ll be a topic of conversation. This dainty gold necklace will look beautiful on Mom. On the disc, you can have her initial added, and even add her birth stone as well. Understated jewelry is a wonderful thing when done well and this necklace is the epitome of that, it’s something that Mom can wear every single day. Whether Mom is a baker or more of a cook, this engraved wooden spoon is something she’ll definitely use. On the handle, you can have the family name engraved so whenever she uses it, she’ll think of the wonderful family she created. Everyone has a favorite mug they use, don’t they? But instead of going for the generic store bought ones, why not get some personalized ones? These gorgeous mugs have a cartoony picture of each family member on them, along with your name, so no one will steal your mug again. If Mom has three children who she absolutely adores, this necklace is the perfect gift for her. On the delicate chain, there’s 3 gold discs which will display the initials of her babies. No matter where they are in the world, they’ll always be close to her heart. This hand stitched pillow would make a perfect addition to the family home. Whether you have it on your sofa, bed or maybe on a shelf, you can have every member of your family depicted…even the family pet. It’s such a special item and something Mom can keep forever. Hang this personalized beach art picture where Mom will always be able to see it, and she’ll instantly be transported back to those family holidays you went on as kids. As well as portraits of you all, your family name is also seen drawn into the sand. You can have every member of your family included on this hand painted portrait. There’s even room for your family pet, whether it’s a dog, cat or guinea pig! Your family name is written above your heads, meaning it would fit right in in any happy family home. The possibilities for this amazingly unique necklace are endless. You can have the soundwaves of anything you say etched onto this sterling silver bar, from “I love you” to something else, anything which means something special to you and your Mom, and engraved on the back is the message you want to give to her. Pets are such a big part of family life, they’re an extension and really make a home come alive. Give your Mom this custom pet nose necklace and she’ll always have a part of her favorite animal with her, wherever she goes and whatever happens. If statement jewelry is something your mom absolutely loves to wear, this necklace is perfect for her. On the sterling silver disc, you can have up to 6 names engraved as well as their birthstones. There’s also a Victorian key charm, and you can even choose the type and length of chain it comes on, as well. Were snowy ski holidays something your parents used to take you on when you were younger? Show your appreciation with this fab and fun personalized gift for Mom; a family portrait which you can choose almost every element of…even your pet can ride up the ski lift ready to hit the slopes. Mom can now show off every one of her children with this 3 disc necklace. On each disc, she can have the names of her babies engraved, along with a gorgeous heart charm. You can choose the type and length of chain as well so Mom is 100% comfortable when wearing it. At first glance, this sterling silver bracelet just looks like a beautiful but plain bracelet. But look again. Inside the large bead, there’s sand which has been collected from a beach of your choice, somewhere which holds special memories for you. You can add up to three beads, each with sand from a different beach. A good family portrait is something which every home should have, but if you’re not a fan of having your photo taken, why not go for this gorgeous alternative? It’s absolutely perfect if you love the outdoors, and you can have up to 14 family members inside the canoe. Love is something we all should have in our lives, and if you’ve been lucky enough to find it or experience it, this equation necklace has an important date for you to remember, as well as love equals infinity, while on the back, there’s a vintage inspired compass rose which finishes it off perfectly. Willow Tree figures are so simple, yet a gorgeous item to have in your home, and this one perfectly encompasses the love between a mother and her son. He can even choose to have it personalized with a special message to the most important lady in his life. This gorgeous vase is absolutely perfect for displaying flowers bought for Mom from Dad. As well as some cute songbirds perched on some leafy branches, there’s also the option for you to add some initials and a date which is special to them -maybe their wedding date? Whether she has one or 4 children, this personalized gift for Mom wll make her fall in love instantly. Inside the beautiful bronze heart, she’ll find a silver key, one for each of her children. It hangs on a sterling silver chain so it will go with any outfit she wears. When your children grow up and fly the nest, it can be a difficult thing to deal with. But you can make that easier on your mom with this personalized coffee mug. Whether you’re in a different state or even country, you can show Mom that you’re still thinking of her. A family bike ride is something we all participate in at some point in our lives, whether it’s with our own parents or your children. Capture that memory with this adorable tandem bike photo; there’s options to add up to 14 people, and even your pet too! This cute necklace perfectly represents the bond between a mother and her child. A large bronze hand represents Mom and the smaller silver one is of the child. Mothers are always there to give us a helping hand when we need it, even when we’re all grown up. Personalized mugs are a great gift to give, but when you want a totally unique one, why not have a go at making it yourself? This tutorial shows you how you can make one for your mom, using some simple materials and turning them into something she’ll love. Jewelry is one of the nicest gifts you can give someone, especially when they can see you’ve really put some thought into it. Follow this tutorial and make your very own swirl ring. Making the jewelry yourself shows that you’ve spent time on it and that means more than anything. Dance Moms give their all to help their little dancers achieve their dreams. This means that Dance Moms eat, breathe, and drink all things dance practically every day. This Christmas, make sure that Mom has all of the gadgets, comfy clothes, and heartfelt trinkets to help her to carry on being the best Dance Mom around.